It is a universally acknowledged truth that people who enjoy running are a little bit nuts. And hey, I’m one of them. Whether it’s trail runs or half marathons, I find it hard to remember the last time a week went by in which I didn’t pound the pavement at least once. Running’s not just good for physical fitness, it’s also great at cracking mental spaces wide open and transforming you from a walking thundercloud into a sunny-smiled optimist. That is, at least until the endorphins wear off—and that’s partly what makes running so addictive. You don’t have to be a great runner to enjoy hitting the streets. You can be a slow runner, an unambitious runner, an antisocial runner, or the kind of showy zealot who posts selfies at the finish line of long-distance races (#guilty). You can wear cheap shoes or expensive ones, view it purely as a cardiovascular workout or use its calm rhythms to resolve the chaos in your personal life. It’s up to you—just take it at your own pace, and Google the TV trope ‘Joggers Find Death’ next time you need a giggle. While the convenience of treadmills may render this article redundant for some runners, it’s great to get out into nature once in a while, especially considering the treadmill was invented to punish inmates of 19th century prisons with repetitive activity... 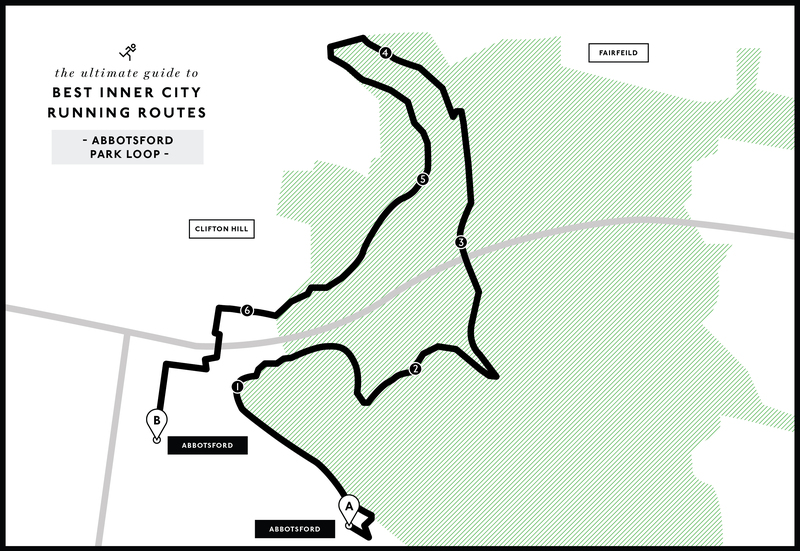 These routes all fall between 7km and 12km, which makes them perfect for pre or post-work outings. 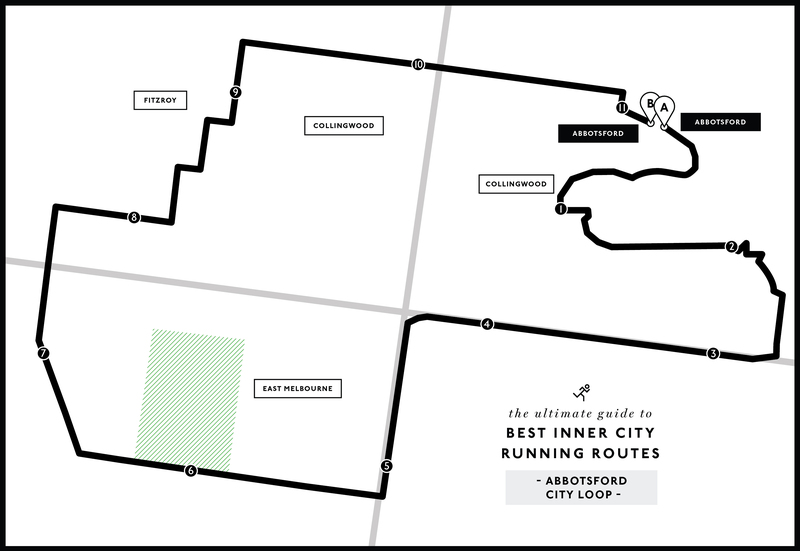 Without further ado, here are five great inner-city running routes, with post-run café suggestions included. Because we know you all too well. Start at the gates of the Abbotsford Convent and run past the Farm Café, past the cute animals, and down along the river until you reach a set of stairs leading up to a bridge. Cross that bridge and turn right onto a dirt trail that winds up above Victoria Gardens Shopping Centre. Follow Victoria Street all the way to Fitzroy Gardens, then jog the perimeter of Parliament Gardens before weaving through the backstreets of Fitzroy, to return to the Abbotsford Convent. Post-run cafés: Admiral Cheng-Ho, Mavis the Grocer, Three Bags Full and The Farm Café. Start at the gates of Abbotsford Convent again, but take a sharp left this time. Follow the river until you reach Dights Falls, then cross a bridge to run through Yarra Bend Park. After you cross the overpass above the Eastern Freeway, you’ll see an 1880s gate pillar from the Yarra Bend Asylum mentioned in this article. Continue to Heidelberg Road, loop back via the lower end of Clifton Hill, and cross another bridge to reach the green oval of Victoria Park. Post-run cafés: Dr Morse, Rita’s Cafeteria, Admiral Cheng-Ho and Bluebird Espresso. Get yourself to the Botanical Gardens and choose a start-point on The Tan. 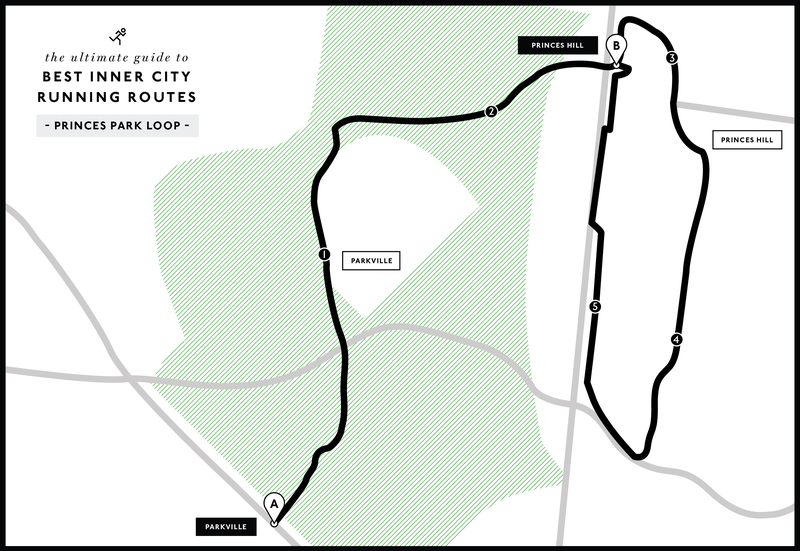 Follow the dirt track for one full loop (bonus points if you scale Heartbreak Hill without stopping), then exit onto Domain Street and run across Toorak Road into Fawkner Park. 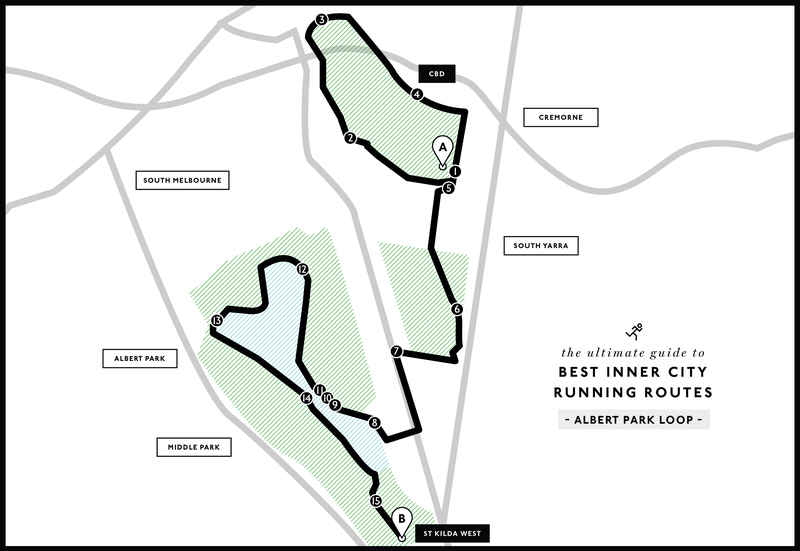 Take any of the criss-crossing paths through Fawkner Park onto Commercial Road, then veer right toward Albert Park Lake. This lake is rather sizeable, and has 500m signs dotted around it as well as free exercise stations. Run a lap then stretch out on the village green. Post-run cafés: The Petty Officer, Truman Café, Dr Jekyll and The Banff. Catch a train to Brighton Beach Station, or drive there—there’s plenty of parking. Follow the Bay Trail up along the beach, taking little deviations as it suits you. After a while, you’ll start seeing parks—that means you’ve hit Elwood. 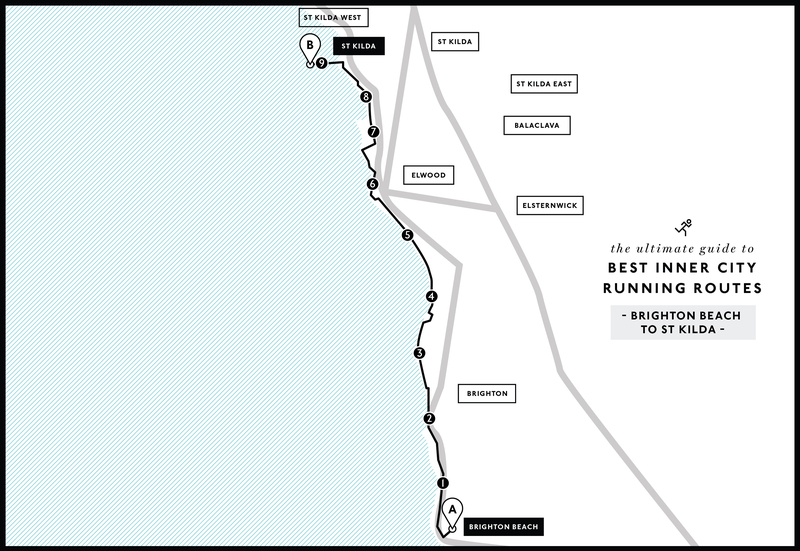 Keep following the trail until you reach St Kilda Boulevard, then run to the kiosk at the end of St Kilda Pier where the little penguin colony lives. Post-run cafés: GB Espresso, Acland Street Cantina, Fitzrovia and Captain Baxter. Set off from North Melbourne and run along the leafy track behind Melbourne Zoo. Veer right at Royal Park station and run past the golf club across Royal Parade to the lower end of Princess Park. Follow the track to complete one loop. If you’re feeling super energetic, you can race the trams heading to Sydney Road on the second half of the run. Post-run cafés: Naughty Boy, North Carlton Canteen, Wide Open Road and Code Black Coffee. Want more awesome places to get fit? Read about our favourite hikes out of the city.